Home ... Herne Bay ... Sign up, sign up! Signs of the times. 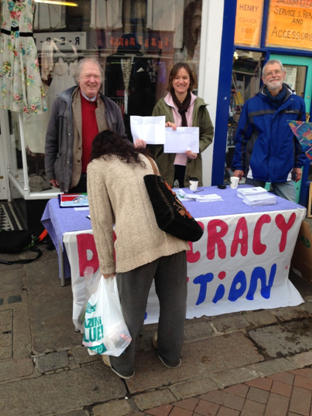 Members of the Campaign for Democracy in the Canterbury District set up the stall in St Peter’s Street, Canterbury, on Friday as part of their bid to gather enough signatures to force a referendum on whether Canterbury City Council should return to the committee system. The stall will be in Canterbury again on Saturday, outside Revivals in St Peter’s Street, and a date is being arranged for Whitstable. A public meeting will also be held in Whitstable in June. Councillors will discuss the issue at a meeting of the full council on Thursday, April 24 after councillors Neil Baker and Simon Cook tabled a motion supporting the switch to committees rather than the existing executive system. But CDCD plans to continue collecting signatures so residents have a voice in the debate. The petition can be downloaded from www.cdcd.co.uk or signed at Revivals, the Smith Shaver and the Comic Shop in St Peter’s Street, Canterbury; Herbaceous, Oxford Street Books and Samson & Coles in Oxford Street, Whitstable, IS2 Gallery in Horsebridge Road, The Whitstable Produce Co and Buttercup in Harbour Street, and the Labour Club in Belmont Road. In Herne Bay it is available in Sweet Magic in Mortimer Street, and also at 92 High Street, Bridge. Delighted to see your CAMPAIGN FOR DEMOCRACY take off,you have our support and you WILL PREVAIL. We at FYLDE are gearing for our REFERENDUM on 22nd May with posters,car window stickers,garden boards,house window stickers etc. Bob Dagnall (member of the civic awareness group at Fylde).